LOCAL BC VEHICLE! LOW KMS! 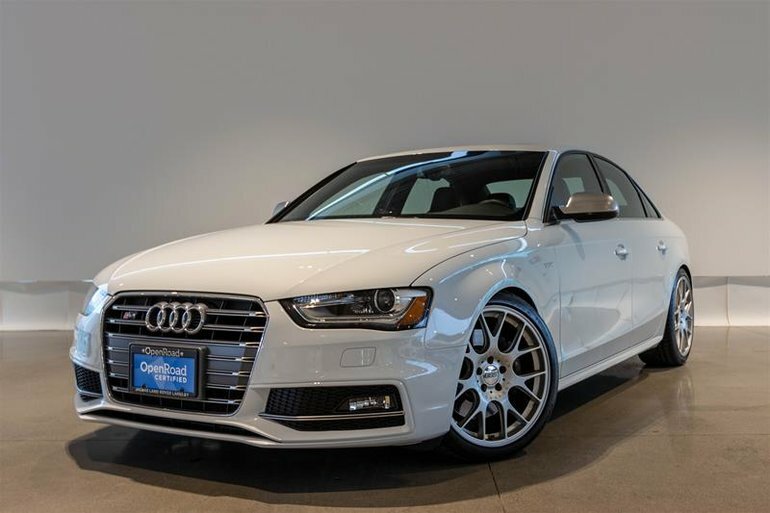 The S4 is Audi's Compact Sport Sedan that features a 3.0L Supercharged V6 motor producing 333HP sent to Audi's Legendary Quattro All Wheel Drive System. Finished in Ibis White on Magma Red and Black Nappa Leather Sport Seats. Standard Features on our Premium model include Heated Front Seats, Power Adjustable Front Sport Seats with Lumbar Adjustment, Power Sliding Sunroof, Signature LED Running Lights with HID Headlights, Audi HDD Navigation System w/DVD Player, HD radio and MMI operating logic, Bang and Olufsen Premium Audio System and more! Optioned on our particular unit is the Audi Quattro Sport Differential including Rear Differential, Audi Drive Select Controls, Variable Throttle Response and more. Also included with this stunning S4 are 19" BBS Aftermarket Wheels with H&R Lowering Springs for a more Sporty look. With only 54,290km this S4 Won't last long. Visit Jaguar Land Rover Langley to book your test drive today. Financing available, Trade-ins Welcome. Interested in the 2013 Audi S4 3.0T S tronic qtro ?